Mónica López Baltodano, author of a book about the Nicaragua Canal (image credit: Jorge Mejia, Cortesia Popol Na). In one sense, it does not matter if the environmentally catastrophic 173-mile, 50-billion dollars Nicaragua Grand Canal mega-project goes ahead or not. Its adverse impacts on Nicaraguans’ human rights are already being felt. That is the message Mónica López Baltodano, director of Nicaraguan NGO Fundación Popol Na. “People say: ‘there’s not even a canal, so what are you fighting for?’” says López Baltodano. Her response is that the very existence of the Canal Law (known as Law 840) means that the government can legally stifle the right to challenge the project and expropriate land for it. As a direct consequence of Law 840, 119.000 people living along the canal route face uncertainty, harassment and intimidation from the government, the police and the army. From the outset, the government – escorted by security forces “armed to the teeth” -, as López Baltodano says, carried out a census of rural communities affected by the canal’s construction. It has since denied them a meaningful consultation on its impacts, she adds. The media have focused on the canal’s lack of progress. According to López Baltodano, this fails however to capture the main issue: the fact that that rights have been eroded since the project was announced in 2013. That year, the Nicaraguan government fast-tracked Law 840, granting Chinese telecoms impresario Wang Jing exclusive rights to build and operate the canal, potentially for a period of over 100 years. From then on, López Baltodano –along with other human rights defenders- has exhaustively documented subsequent rights violations of Nicaraguan citizens. 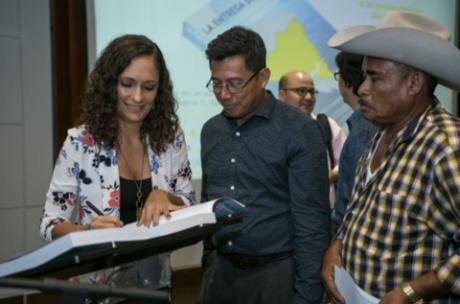 To mark the fourth anniversary of the canal concession, in June this year López Baltodano released a book entitled Handing over a country: Legal implications of the Nicaragua Canal concession. She describes the book as a compendium of legal documents and a register of the marches that have been organized (the 91st one took place on August 15), of the petitions (an online Save the forest petition garnered over 80,000 signatures) and of the media reports relating to the canal. It also records the intransigence with which she claims the government has met the anti-canal campaign. “There’s not even the possibility of access to justice [in Nicaragua],” López Baltodano says, as she recalls the obstacles faced by the joint campaign with rural community organisation National Council for the Defense of our Land, Lake and Sovereignty in trying to get the canal law repealed. Denied an audience at home, campaigners announced on July 26 that they would take the case to the Inter-American Court of Human Rights (IACHR) in Costa Rica’s capital San José, which has the power to order national governments that have submitted to its jurisdiction (as Nicaragua has) to comply with its rulings. But there have been IACHR rulings against Nicaragua before, and they have not always been respected. In 2001, the regional court ordered the Nicaraguan government (then led by the liberal president Arnoldo Alemán) to legally recognise the Awas Tigni indigenous group’s right to ancestral territory, which had been unlawfully encroached by settlers from elsewhere in Nicaragua. The ruling was reflected in national Law 445, but it has yet to be fully implemented – which means that many indigenous groups across Nicaragua keep on having their territorial integrity violated. Given this precedent and the lack of due process afforded Nicaraguans, isn’t López Baltodano concerned that the government would fail to comply with any IACHR ruling? And if so, what would happen? “There’s not even the possibility of access to justice [in Nicaragua]”. As a result, the new demands of this movement, though still relatively small in numbers, present a challenge to the country’s political ways which, according to López Baltodano, typically involve the cooptation of social movements by existing political parties that then do little to advance their agenda. This is not only true of the ruling party, the Frente Sandinista de Liberación Nacional (FSLN), but also of other smaller parties that provide little effective opposition. López Baltodano maintains that legal actions and the activity of social movements have been “very significant” in halting the canal. But she fears the counter-attack measures which the alliance of strong business interests and a politically wounded government will exact towards canal opponents. In Nicaragua, citizens trust the country’s security apparatus since the 1980s Sandinista revolutionary government reformed its role following the overthrow of dictator Anastasio Somoza. The country is thus nowhere nearly as dangerous for land and environmental rights activists as neighbouring Honduras, where they are being killed in record numbers. Nevertheless, the right to peaceful protest and a proper consultation on the impacts of projects are in jeopardy following the “extremely fast” and “opaque” approval of the Canal Law, as Amnesty International has identified in a recent report. A letter to The Guardian argued that the Amnesty International report did not take into account surveys indicating that opponents of the canal are a minority. It also argued that the history of foreign control over Nicaragua’s economy and the existing high levels of poverty mean that most of its citizens, and the trade unions, believe that the project would generate local employment and much-needed benefits. “We’ve opened up a box and it requires tremendous documentation throughout a wide extension of Nicaraguan territory. And we don’t have the means to do it”. The fact that the government controls a large proportion of the media in Nicaragua certainly plays a part in shaping public opinion. López Baltodano says this is a problem: transmitting information contesting the government line is difficult, especially in communities with limited internet access or mobile phone signal, such as those affected by the canal. Nevertheless, she adds, independent media and social networks have played a relevant role in the effort to overcome this communication barrier. López Baltodano is against interference by foreign powers in national affairs. But she says that the anti-imperialist rhetoric, which is – understandably - common in Nicaragua since the US supported the Contras – the counterinsurgency against the Sandinistas in the 1980s -, is now being used to justify the canal. According to some on the Left, investment from Russia or China is welcome, as it represents a counterweight to US power. Nicaragua does not currently have diplomatic relations with China. However, Central American countries including Costa Rica (2006) and Panama (June 2017) have established formal diplomatic ties, paving the way for a more comprehensive trade and investment relationship. The fact that the government controls a large proportion of the media in Nicaragua certainly plays a part in shaping public opinion. Though the government frequently takes aim at the US, which recently advanced the process of sanctioning Nicaragua for supporting Nicolás Maduro’s troubled regime in Venezuela, it is not always the focus of a perceived threat to sovereignty. Since the canal project was announced, “people say ‘Chinese out!’ just as they used to say ‘Gringos out!’”, says López Baltodano. Regardless of any perception of predatory economic interests, she agrees that some of the infrastructure associated with the canal, such as the proposed deep-water port at the Caribbean town of Brito, might benefit the country economically – Nicaragua is the second poorest country in the Western hemisphere - provided it is done under a completely different legal agreement. But the point, she argues, is that all and every project should be assessed on its own merits. They should not be approved sweepingly and without proper consultations, nor without independent social, economic, and environmental feasibility studies. For this to happen, the Canal Law must be repealed, the government must hold proper bidding processes for each project (Wang Jing was the only bidder for the canal concession), carry out impact studies and apply relevant laws. López Baltodano admits that maintaining the international legal challenge to the Canal Law is a huge task: “We’ve opened up a box and it requires tremendous documentation throughout a wide extension of Nicaraguan territory. And we don’t have the means to do it”. Despite some fatigue, she remains motivated: “Everyone who’s been part of this movement, and I mean rural communities too, realises that they’re part of something really important”. She adds that previously divided sections of society such as black and mestizo groups, or country and city people, have united behind the campaign: “We’re part of a national awakening. This is going to have an impact on the country that we cannot yet measure”.